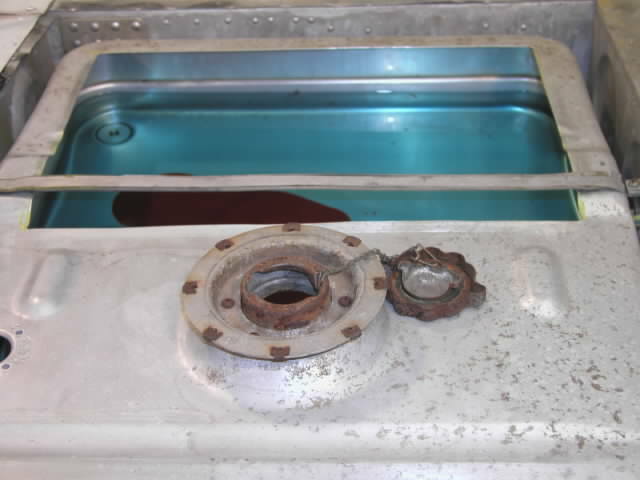 Purpose of Test: Determine if tank's sump drain is located at tank's sump. This page is designed to be viewed in 1024x768 resolution using medium text. 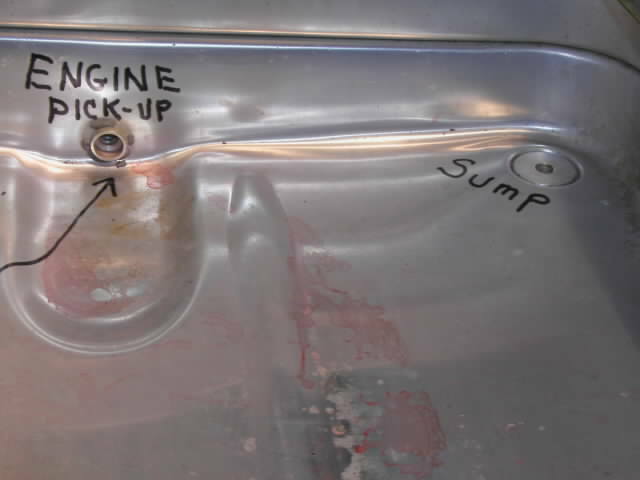 This image presents an interior view of a Cessna 150 tank with important areas of the tank labeled Engine Pick-up and Sump. 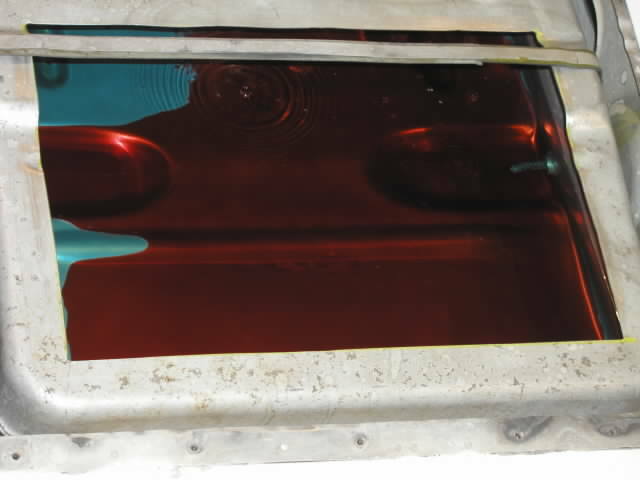 When the tank is installed in an aircraft's wing, the left side of the tank in the image is toward the front of the wing, and the surface shown in the image where the label Cessna 150 Tank appears is the bottom of the tank. The engine pick-up is where the contents of the tank enters an aircraft's fuel line. The sump label indicates the location where an "external drain" is installed for the purpose of taking fuel samples. 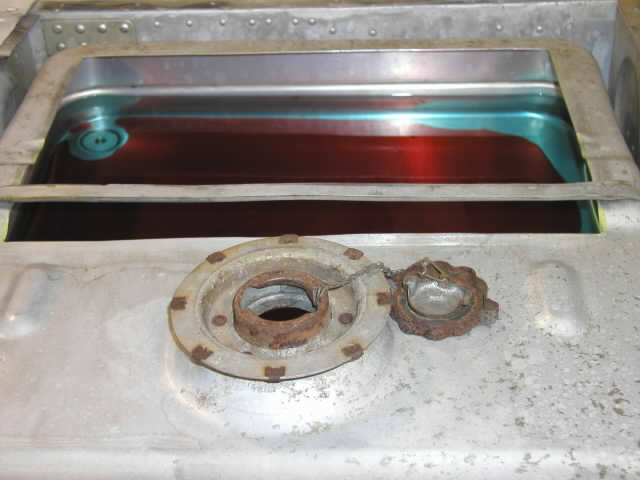 The label Sump in the image is used to identify the "Sump Drain," not the tank's sump. 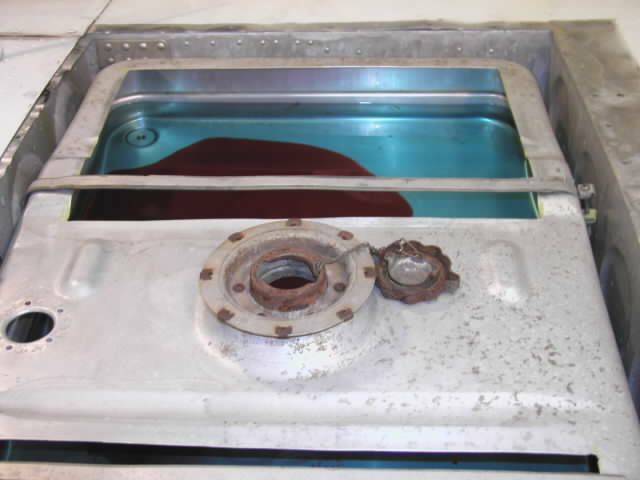 The tank's sump is a low point located somewhere on the tank's bottom surface to where liquids flow under the force of gravity. 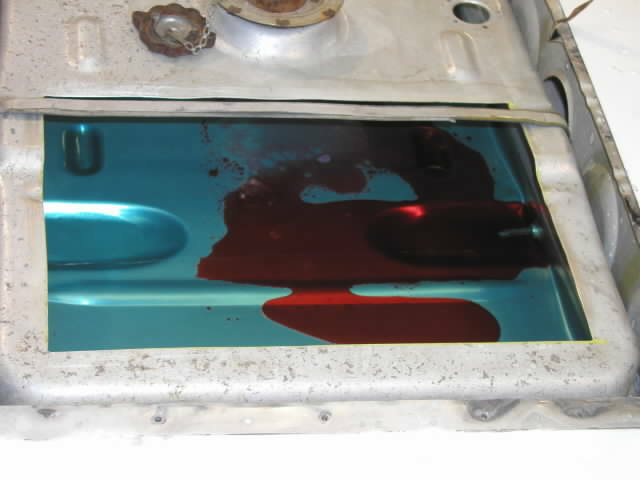 An ideal tank design should have a "sump drain" installed at the sump. 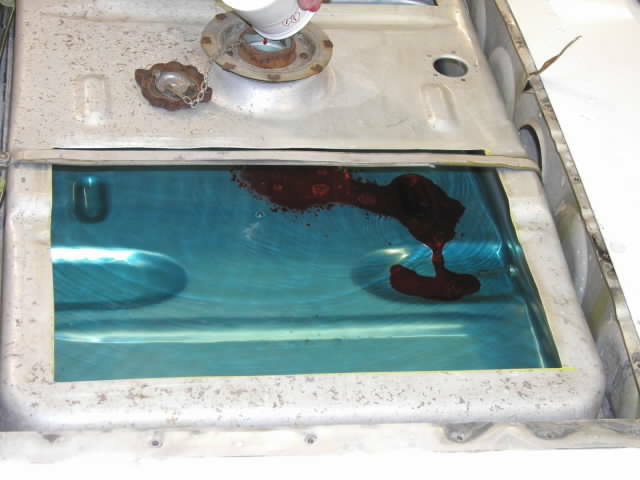 One of the objectives of this test was to determine if the Cessna 150 Tank's sump drain is located at the tank's sump. This image is a close-up view of the Cessna 150 tank's engine pick-up and sump drain. 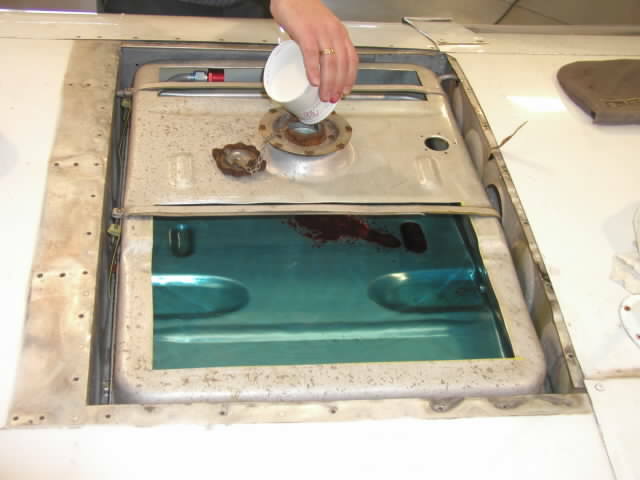 Because the tank's sump drain is used by pilots to take fuel samples from the tank during a preflight check, the location of the sump drain is critical to safety of flight. 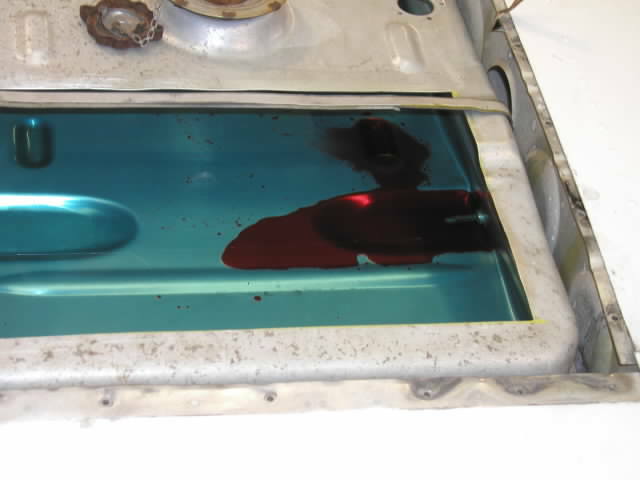 The reason a pilot takes a fuel sample from the sump drain is to determine if the fuel in a tank is contaminated. 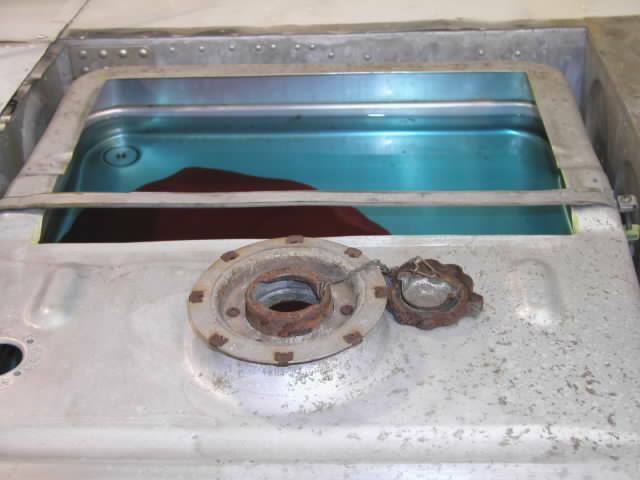 There are at least three conditions that must be met if a sump drain is to be used as a means for positive detection of fuel contamination where contamination is caused by liquids heavier than fuel. One condition is that a tank must have a sump. 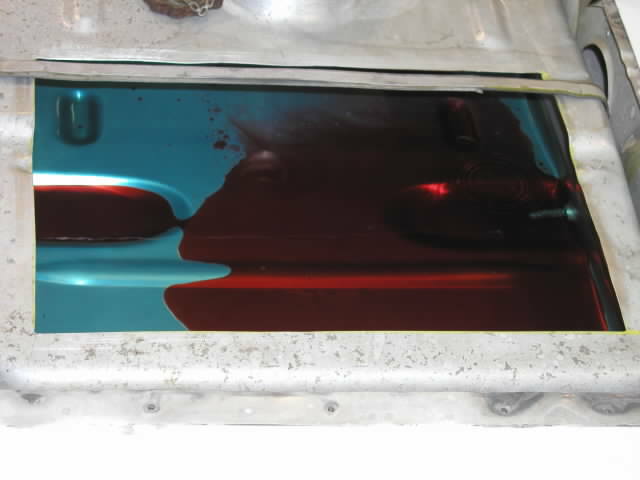 A second condition is that heavier liquids must be permitted to freely flow under the influence of gravity to the sump. And a third condition is that a sump drain must be located at the sump where contaminates are expected to be. 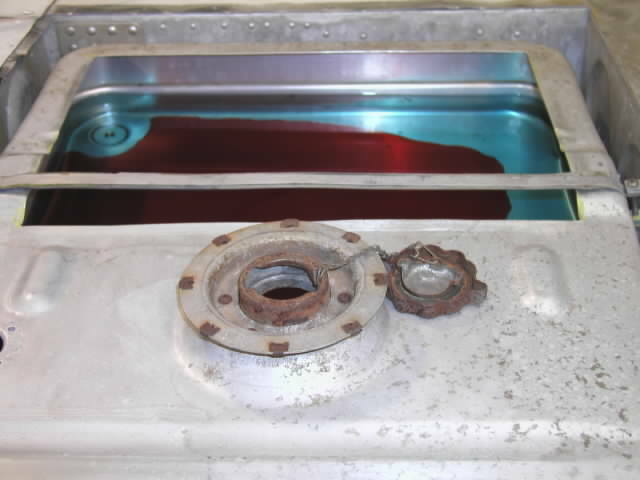 If any one of these conditions is not met, a pilot can not rely on a fuel sample taken from a sump drain as a means for positive detection of fuel contamination. 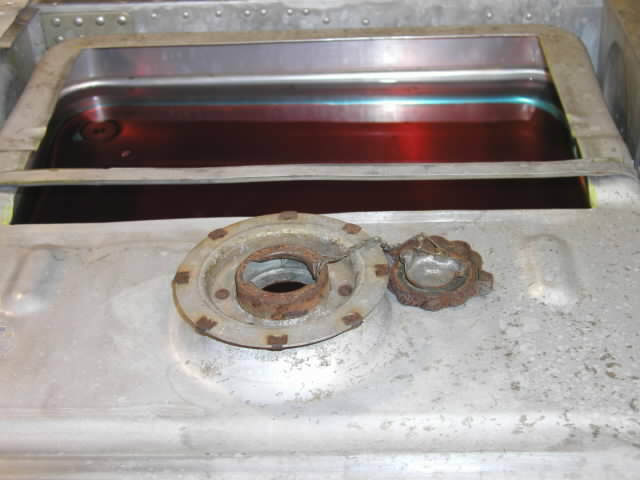 If a fuel sampling method fails to positively reveal the status of contamination or non-contamination of fuel, then of paramount importance to flight safety is the location of the engine pick-up relative to a tank's sump. 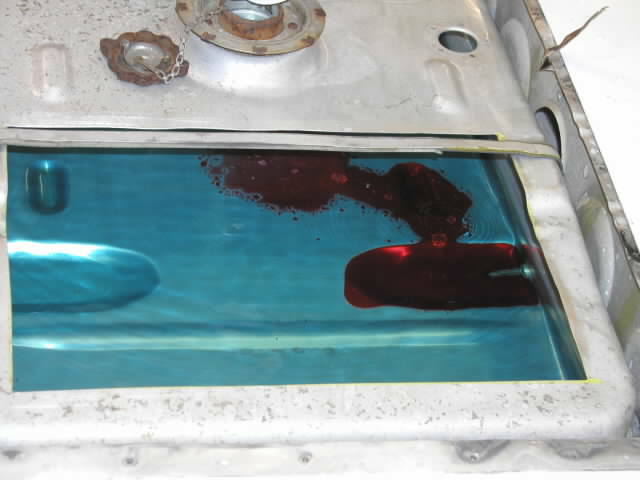 Because of its importance to flight safety, this test makes observations of the engine pick-up with respect to the tank's sump to determine if contaminants at the sump could potentially be drawn into an aircraft's fuel line through the fuel intake valve that is labeled engine pick-up in the image. For the test, water was used as a heavier than fuel contaminant. 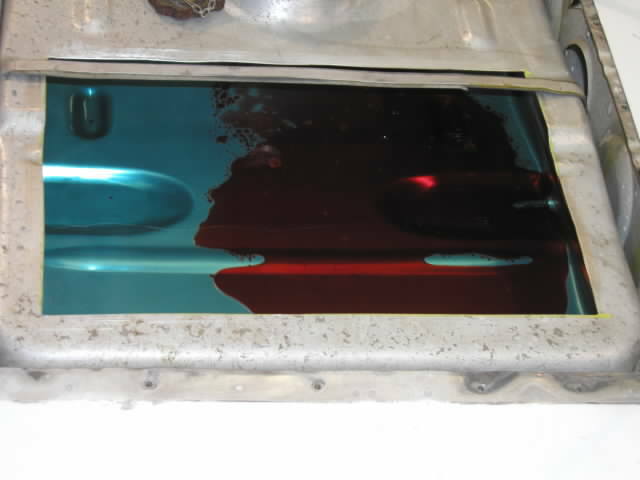 A red color dye was added to the water to contrast it against the fuel's blue tinted color, which permitted visual observations to be made about the water's motion and location in the fuel tank. 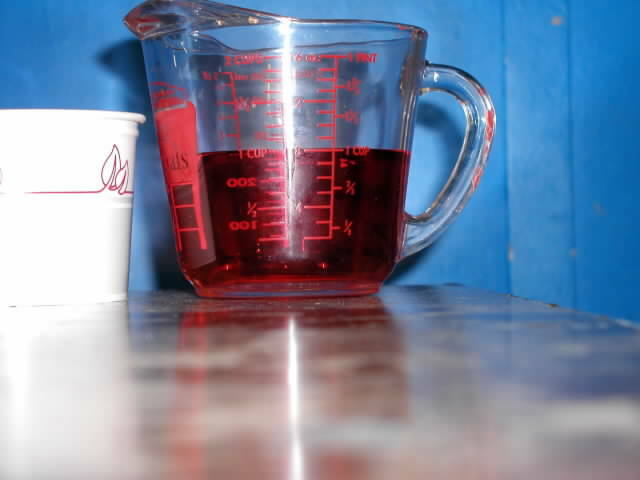 A measuring cup was used to measure 2 ounce and 8 ounce quantities of water. Each quantity was added to the fuel tank in increments and permitted to accumulate with previously added quantities. At the start of the test, the tank contained 5-gallons of fuel with no water. Then a 2 ounce quantity of water was added and permitted to settle to the bottom of the tank. Observations were made that noted where the water settled. Additionally, observations noted the water's location with respect to the sump drain and the engine pick-up. After these observations were made, another 2 ounces of water were added, and more observations were made. Water was added in 2 ounce increments until 8 ounces accumulated in the tank. Then water was incrementally added in 8 ounce quantities. In this way, water was incrementally added and permitted to accumulate until the tank contained a total of 88 ounces of water. This image shows the first 2 ounces of water being added to the tank containing 5 gallons of fuel. The Cessna 150 tank was installed in the wing of a Cessna 152 aircraft. The aircraft was positioned in a normal ground attitude so that the tank's attitude was the same as it would be during a preflight check. There are subtle differences between a Cessna 150 model aircraft and a Cessna 152 model aircraft, but the differences did not affect the tank's attitude, sump and sump drain in the test's simulated preflight conditions. The 2 ounces of water that was added above in Image 5 was permitted to settle to the bottom of the tank. 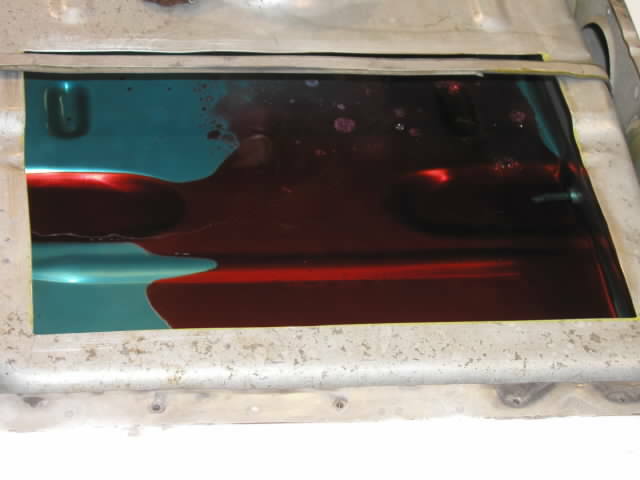 Here, Image 6 shows a view from the front of the tank after the 2 ounces of water settled. 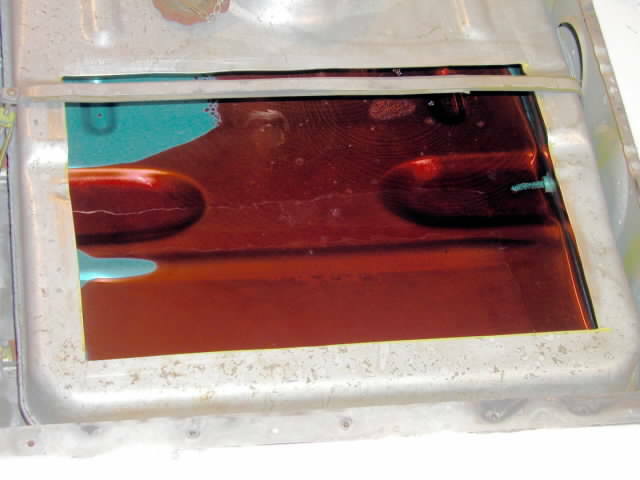 The fuel in the tank is sufficiently transparent to permit the tank's sump drain to be seen, which is the small, circular disk object at the bottom of the tank in the top left area of this image. 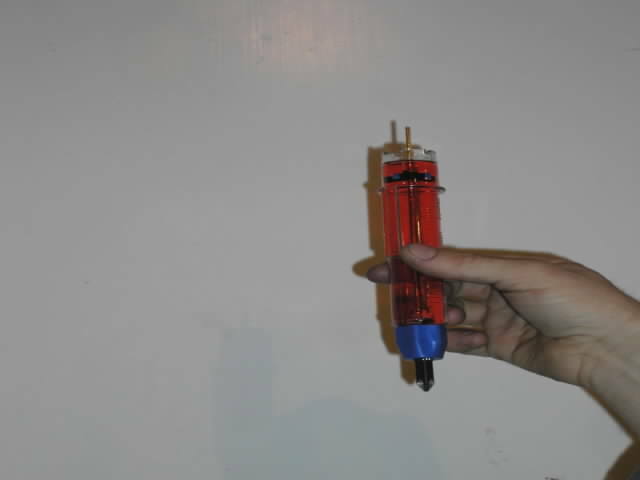 It can be seen in this image that none of the 2 ounces of water that was added above in Image 5 reaches the sump drain. Here, an additional 2 ounces of water is being added bringing the total accumulated water in the tank to 4 ounces. As this image indicates, the water was observed to flow to the reservoir located directly beneath the engine pick-up. 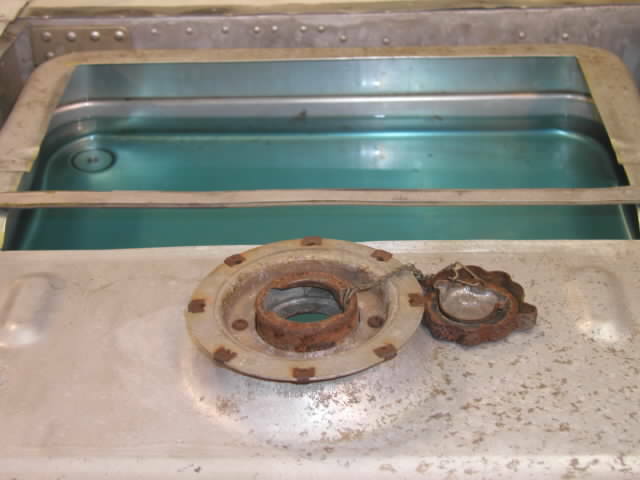 The 4 ounces of water was permitted to settle, and as this image indicates, most of the water was observed to settle in the reservoir located directly beneath the engine pick-up. Therefore, this area is either the tank's sump, or the reservoir prevented the water from flowing to the tank's sump. 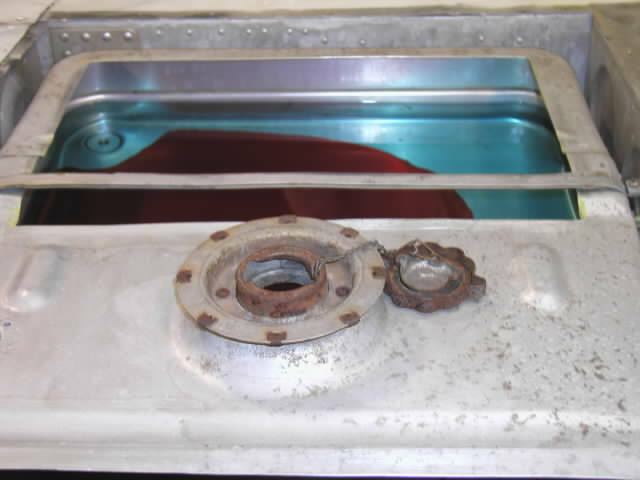 This image shows a view of the tank's sump drain with the tank containing the 4 ounces of settled water shown above in Image 8. 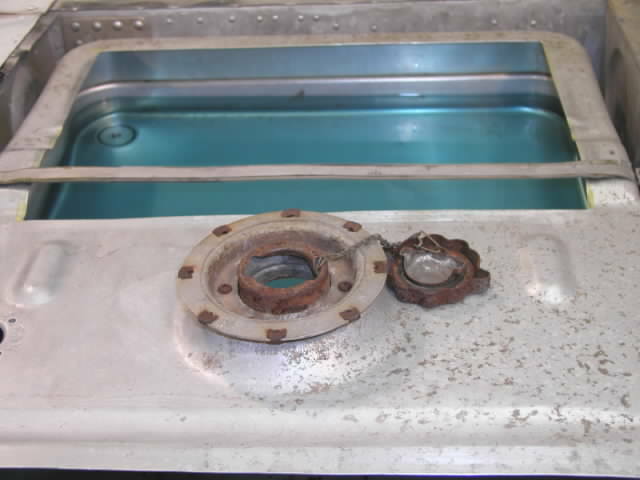 None of the 4 ounces of water reached the sump drain indicating that either the drain is not located at the tank's sump or that the water was unable to flow freely to the tank's sump. Another 2 ounces of water was added to the tank bringing the total accumulated water to 6 ounces. Again, as this image indicates, the water was observed to flow to the reservoir located directly beneath the engine pick-up. 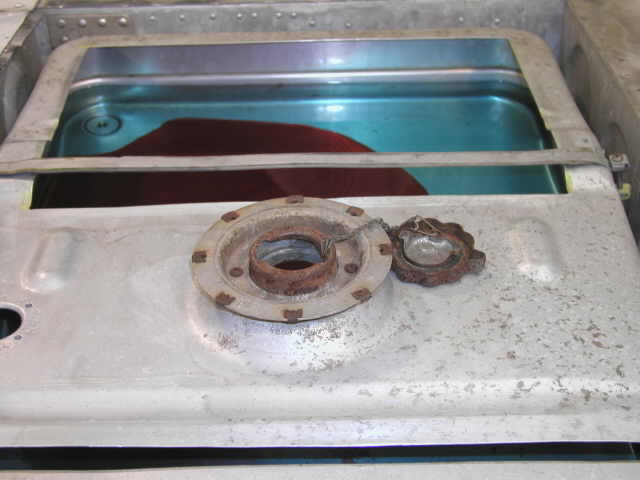 As this image indicates, when the total 6 ounces of water settled, the reservoir located directly beneath the engine pick-up was observed to be filled to near full capacity. This image shows a view of the tank's sump drain with the tank containing the 6 ounces of settled water shown above in Image 11. None of the 6 ounces of water was observed to reach the sump drain. Another 2 ounces of water was added to the tank bringing the total accumulated water to 8 ounces. Here, as this image indicates, the water was observed to flow toward the reservoir located directly beneath the engine pick-up, but the reservoir's capacity was exceeded with the additional water. The next image, Image 14, shows how the water eventually settled. With 8 ounces of total water in the tank, the reservoir located directly beneath the engine pick-up was filled to full capacity, which permited some water to cross the reservoir and continue flowing under the influence of gravity along a path of least resistance toward the tank's sump. However, as can be seen in this image, the water's flow appeared to be obstructed by the tank's rib that runs left to right in the image. That is, the tank's rib appeared to dam some of the water preventing it from freely flowing to the tank's sump. This image shows a view of the tank's sump drain with the tank containing the 8 ounces of settled water shown above in Image 14. None of the 8 ounces of water was observed to reach the sump drain. Here, with 8 ounces of water settled in the tank, a half-gallon of fuel was added making the total amount of fuel equal to 5.5 gallons. The fuel was added using a regular fuel nozzle for the purpose of observing the settled water's behavior during a simulated fueling service. 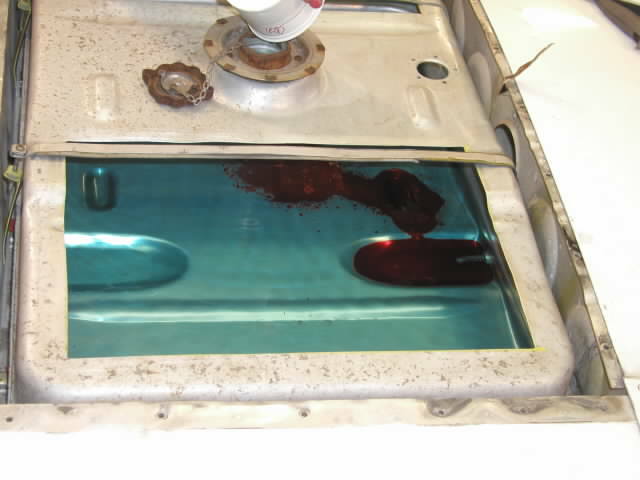 Observations indicate that the simulated fueling of a Cessna 150 tank containing 5 gallons of fuel does not significantly displace the 8 ounces of water from where it settled as indicated in the next image, Image 17. This image shows the fuel and water settled after the simulated refueling shown above in Image 18. This image, Image 17, and Image 14 are shown side-by-side in the next row. Comparing these images indicates that the simulated refueling did not significantly displace the 8 ounces of settled water. Image 14: Before refueling (compare to right). Image 17: After refueling (compare to left). From here, and throughout the remainder of the test, an 8 ounce quantity of water instead of a 2 ounce quantity of water was incrementally added to the tank. 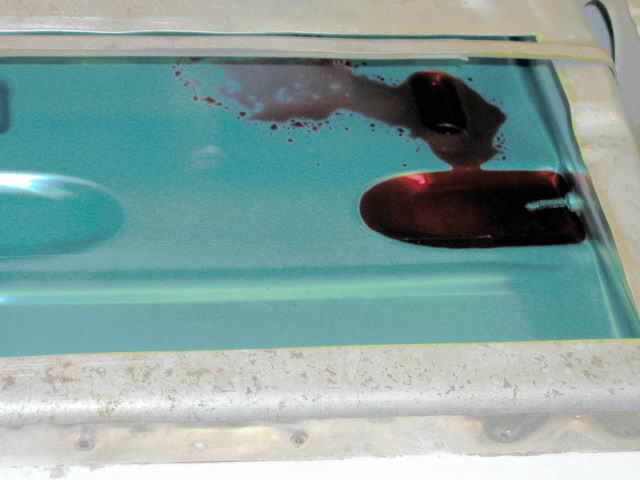 In this image, 8 ounces of water has been added, and the total accumulated water shown settled in the tank is 16 ounces. As indicated in the image, some of the 16 ounces of water crossed over the tank's rib, flowed toward the sump drain (downward in the image) and eventually settled in what appeared to be the tank's natural sump. This image shows a view of the tank's sump drain with respect to the 16 ounces of settled water shown above in Image 18. 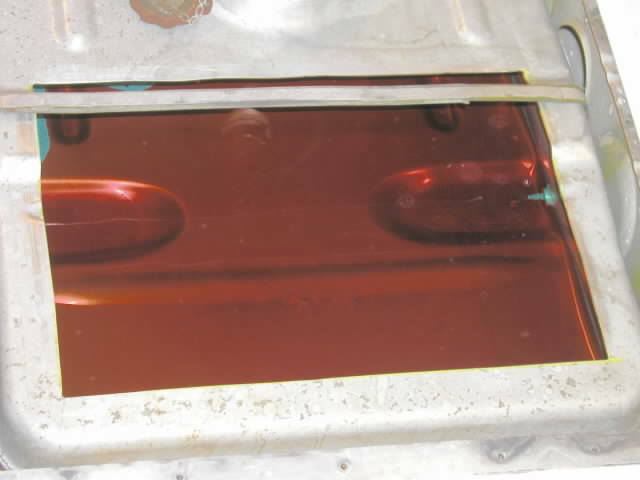 As indicated from observations made during the test, this image indicates that some of the 16 ounces of water settled in the vicinity of the sump drain but did not reach it. Thus, it appears that the sump drain is not located at the tank's sump. Now, the test proceeded to discover how much water must be added before it reaches the sump drain. An additional 8 ounces of water was added and permitted to settle in the tank. In this image, the tank contains a total of 24 ounces of water. 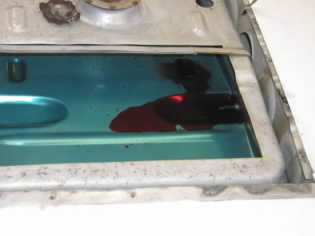 This image shows a view of the tank's sump drain with respect to the 24 ounces of water shown above in Image 20. An observation made during the test suggested that the height of the tank's bottom at the exact location of the sump drain prevented any of the 24 ounces of water from reaching the drain. Therefore, the remainder of the test involved adding 8 ounce quantities of water until the water level reached the height of the sump drain. 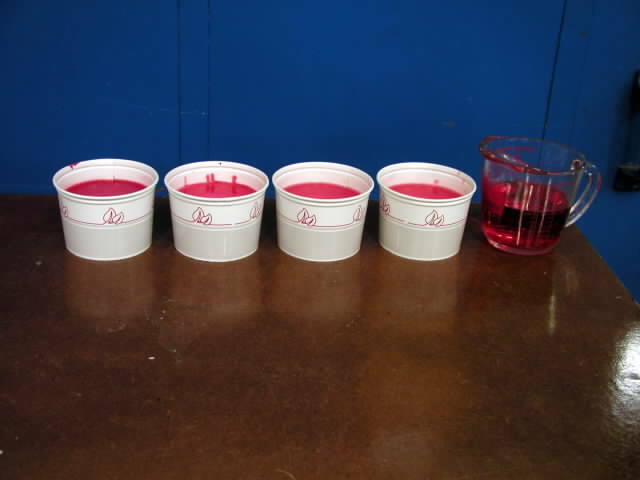 The following images show the incremental results of adding an 8 ounce quantity of water in each increment. 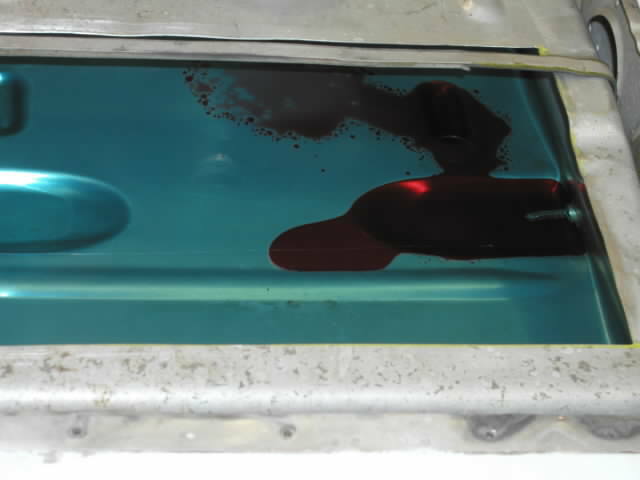 This image shows the Cessna 150 tank after adding an additional 8 ounces of water that was permitted to settle bringing the total accumulated water to 32 ounces. With 32 ounces of water in the tank, the water level still did not reach the sump drain. 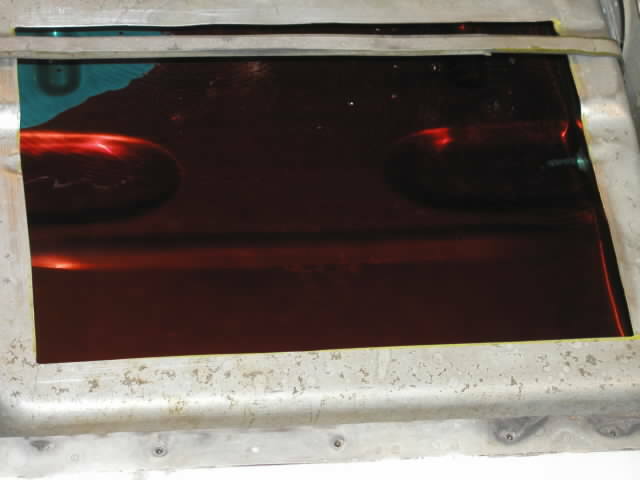 This image shows the Cessna 150 tank after adding an additional 8 ounces of water that was permitted to settle bringing the total accumulated water to 40 ounces. With 40 ounces of water in the tank, the water level still did not reach the sump drain. 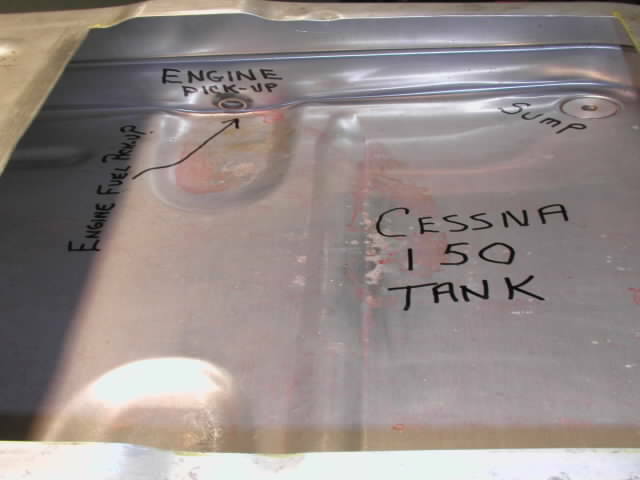 This image shows the Cessna 150 tank after adding an additional 8 ounces of water that was permitted to settle bringing the total accumulated water to 48 ounces. With 48 ounces of water in the tank, the water level still did not reach the sump drain. 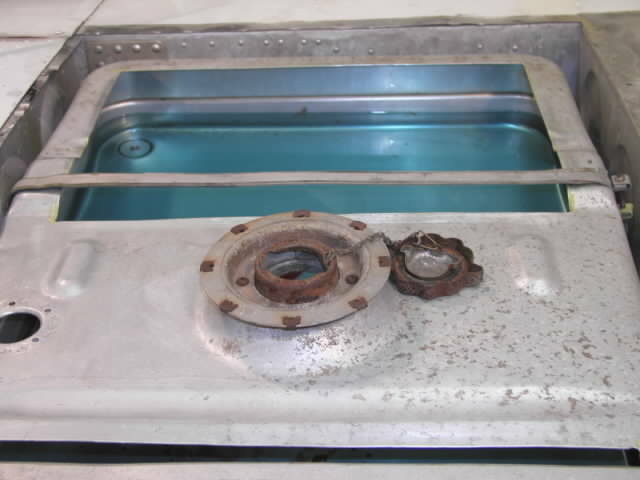 This image shows the Cessna 150 tank after adding an additional 8 ounces of water that was permitted to settle bringing the total accumulated water to 56 ounces. With 56 ounces of water in the tank, the water level still did not reach the sump drain. 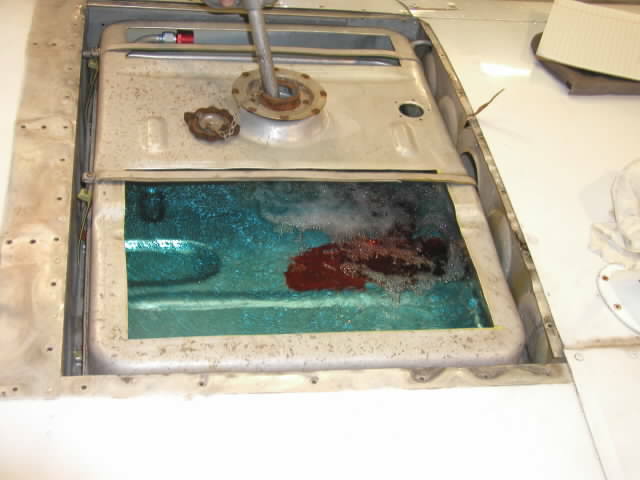 This image shows the Cessna 150 tank after adding an additional 8 ounces of water that was permitted to settle bringing the total accumulated water to 64 ounces. With 64 ounces of water in the tank, the water level still did not reach the sump drain. 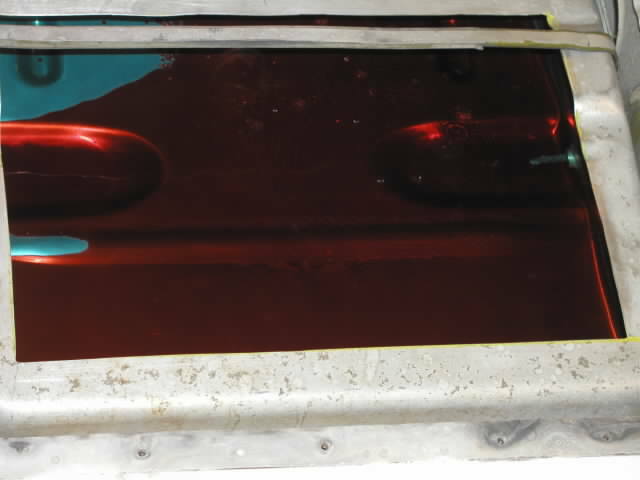 This image shows the Cessna 150 tank after adding an additional 8 ounces of water that was permitted to settle bringing the total accumulated water to 72 ounces. With 72 ounces of water in the tank, the water level is still below the height of the sump drain. 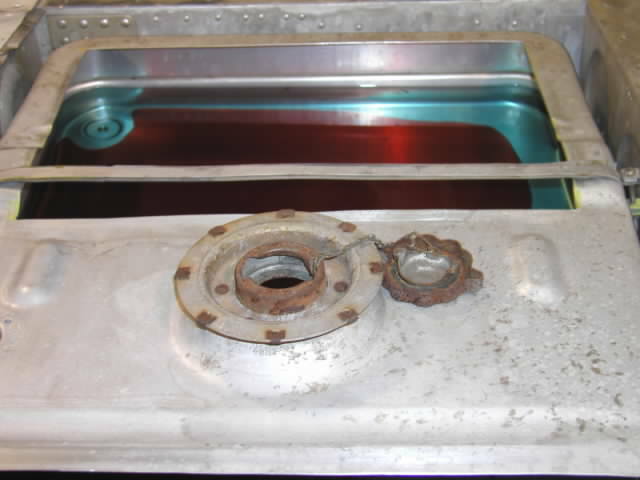 This image shows the Cessna 150 tank after adding an additional 8 ounces of water that was permitted to settle bringing the total accumulated water to 80 ounces. With 80 ounces of water in the tank, the water level is still below the height of the sump drain. 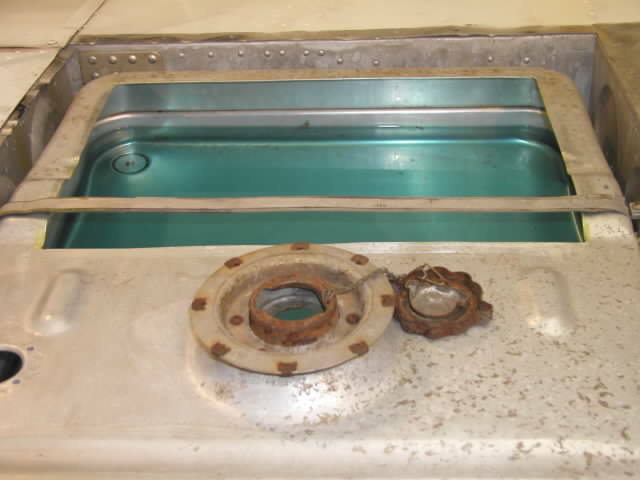 This image shows the Cessna 150 tank after adding an additional 8 ounces of water that was permitted to settle bringing the total accumulated water to 88 ounces. See the next image that shows a view of the sump drain with this 88 ounces of water in the tank. This image is another view of the tank with 88 ounces of water. As can be seen in this image, the water level exceeded the height of the tank's bottom at the exact location of the sump drain. The total water added to the tank during the test to reach this level accumulated to 88 ounces. 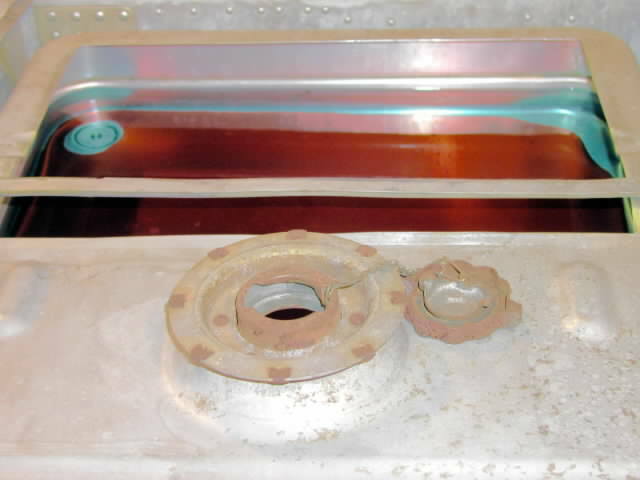 With the Cessna 150 tank containing 5.5 gallons of fuel and 88 ounces of water, a fuel sample was taken from the sump drain. 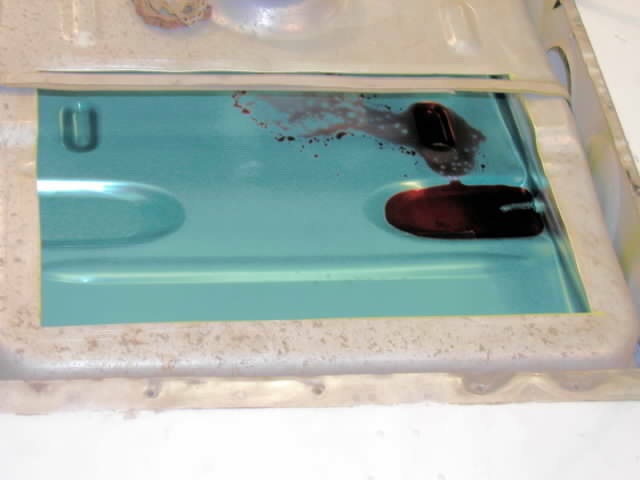 This image shows the fuel sample that was taken. 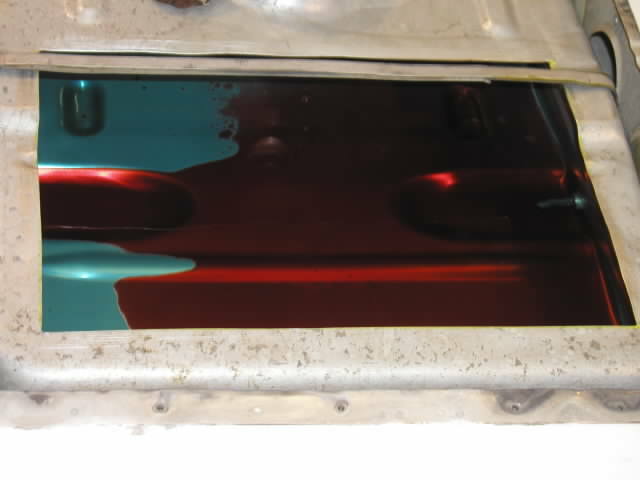 The sample cup is filled with red colored water indicating that water can be detected from the sump drain provided water can reach the drain. This image is the last image in the Cessna 150 tank test. Use the links at the bottom of this page to navigate to a SumpThis page of your choosing, or use your browser's back button to return to your browser's previously viewed page.